Altogether, Virginia Beach stretches from the Chesapeake Bay to the North Carolina border, encompassing twenty-eight miles of oceanfront and bay beaches, which allows it to lay claim to being the world's largest resort city. Sure, there's classic eastern shore development, but the locals have gone out of their way to keep things user-friendly. No matter what shore activity your family enjoys, it's here. And, you can get away from all the hubbub at Seashore State Park with its woodlands and twenty-seven miles of nature trails. Beach life centers on a three-mile "boardwalk". The commercial strip begins at First Street and runs north, with large hotels lining the beach for about 40 blocks. 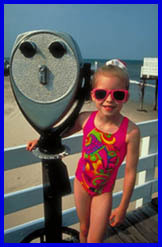 Make the Virginia Beach Visitor Information Center (2100 Parks Avenue) one of your first stops. It'll help you get oriented. Beyond the oceanfront, Virginia Beach is a sprawling city with a very suburban feel. The boardwalk isn't literally made of wooden boards. It's paved. A bike path parallels the walk, which means that here, unlike most eastern beach towns, you can cycle or in-line skate during peak hours. Even skateboarders are welcome there - a true rarity. The walk is grass-lined, and calm - not filled with kitschy amusements and shops - and each block is well-marked. The 7th, 17th and 24th Street Stages present performances nightly throughout the summer; look for the schedule on bulletin boards mounted along the boardwalk. The main beach is wide, clean and well-kept, but it can get crowded. Public changing facilities - another feature too often absent at other eastern shore towns - are located at First Street and Atlantic Avenue. Several public restrooms are also available. Parking can be a problem; look for public lots at 4th and Atlantic or 19th and Pacific, plus the occasional private lot. Metered street parking is hard to find. First Landing/Seashore State Park (2500 Shore Drive, Virginia Beach, VA 23451-1415; 757-412-2300; www.dcr.state.va.us/parks/1stland.htm ) has a small beachfront, its own parking and few folks. This is Virginia's most popular state park. It covers 2,700 acres with camping, displays, three indoor aquaria, restrooms, showers and offers hiking, water sports and equipment rentals, along with bicycle trails and bike rentals. Locals like Little Island Park, a city park that partially borders a wildlife refuge; plenty of fee-parking, rest rooms a snack bar and a fishing pier are available. Once you've parked your car, make use of the trolleys. They cover most of the important ground. An "Entertainment Express" runs a circuit of all the major nightspots and hotels until 2:30 a.m.
Biking is well-facilitated here. In addition to the beachfront bike path, the Seashore State Park trail system can be readily reached by trail from the boardwalk. It has miles of paved and dirt trails that travel through the wetlands and along Broad Bay. The main bike also path runs south of the Boardwalk, following General Booth Boulevard past the Virginia Marine Science Museum and Ocean Breeze Fun Park. Traveling with a surfer? Did you know that Eastern surfing began in Virginia Beach? That was about 1912. Today, Virginia Beach annually hosts the East Coast Surfing Championships. A plethora of surf shops, many of which rent equipment, can be found in town. The Virginia Marine Science Museum (757-425-3474; www.vmsm.com ), a major aquarium, has recently undergone extensive expansion. It occupies two buildings - the Atlantic Ocean Pavilion, site of the main exhibits, and the Owls Creek Marsh Pavilion, which focuses on life in Owls Creek salt marsh, the waterway on which the museum is located. A short Nature Trail connects them. Kids love the exhibits that feature sharks, stingrays, whales and the harbor seals. But, the local sea and lowland environment is well presented through fun exhibits. Favorites in the Pavilion are the river otters, seahorses and the macro-marsh, a place where teeny animals and plants are magnified to ten times their normal size. A ten-minute film, "The Secret Life of Owls Creek" reveals the many unseen goings-on among the plants and wildlife. For an extra fee, the museum offers half-hour salt marsh tours in a fifty-passenger pontoon boat. Virginia Beach is also home to the Atlantic Wildfowl Heritage Museum (757-437-8432), a venue for the work of wildfowl artists; the Oceana Naval Air Station Tour (757-640-0300; www.nasoceana.navy.mil ), displaying more than 200 aircraft; Old Cape Henry Lighthouse in Fort Story (757-422-9421), built in 1791; and The Old Coast Guard Station (757-422-1587), showcasing local maritime history, including wrecks and rescues. FOR MORE INFORMATION Virginia Beach Visitors Center. 2100 Parks Avenue, Virginia Beach, VA 23451; 800-446-8038; www.city.virginia-beach.va.us or www.vabeach.com . The Cavalier Hotel. Oceanfront at 42nd St.; 800; 446-8199 or 757-425-8555; www.cavalierhotel.com. . A world-class resort with five restaurants, indoor and outdoor Olympic-size swimming pools, health club, and the only private beach in Virginia. They offer Camp Cavalier for ages 4-12 during summer, a free, supervised program with morning and afternoon sessions, and Kids Cafi, a dining room for kids only. Holiday Inn Sunspree Resort. 39th Street & Oceanfront; 800-942-3224 or 757-428-1711; www.va-beach.com/sunspree. A 266-room property with fifty-five efficiency suites, all with ocean views refrigerators, coffee makers, irons, ironing boards, in-room movies and Nintendo, and indoor and outdoor pools. The Kidzone activity program offers supervised activities for children ages 4-11. ...... Mitch Kaplan is the author of "The Unofficial Guide to the Mid-Atlantic with Kids," and a contributor to "The Unofficial Guide to New England & New York with Kids," as well as "The Cheapskate's Guide to Myrtle Beach" and "The Golf Book of Lists".